This prompt cracked me up. First, the title – “Ch-ch-changes” – had me scooting on over to YouTube to put on some mood music. Describe your garden right now. Well, 3 feet of snow, except just outside the back door where we shoveled a couple times last year. There it’s only about 2 feet deep, and packed down. The whole garden: white, with boot prints (or boot holes? ), because I gave up, and finally took the garbage out yesterday, and while I was doing that, I decided to take an adventure walk over to the fence, to see how deep the snow was. Up to my knees in the shallow spots, it is. 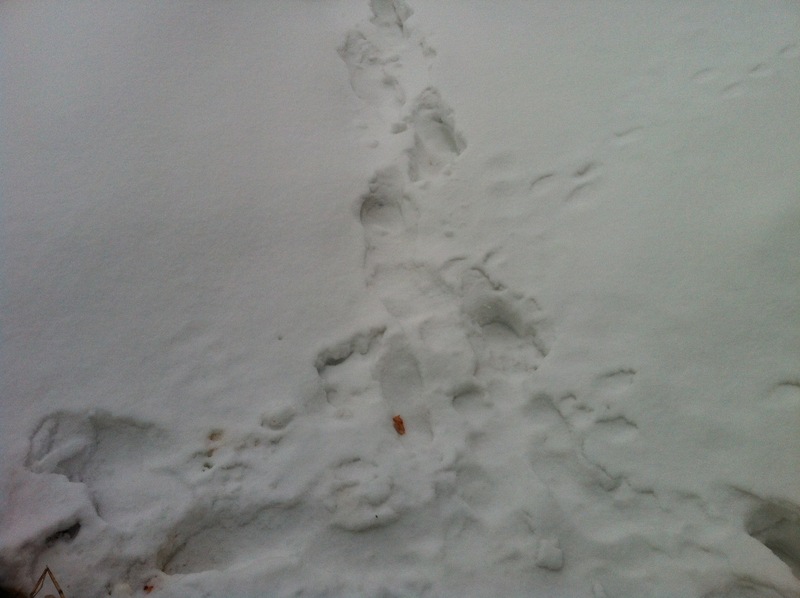 the stick and red spot are little bits of compost escaping from the pile beside my back door…also, bunny tracks! Depressing, cold, and seemingly never changing. “Ch-ch-changes” in my garden – I’m not so sure. But at least I’m going to be grooving to David Bowie all afternoon. 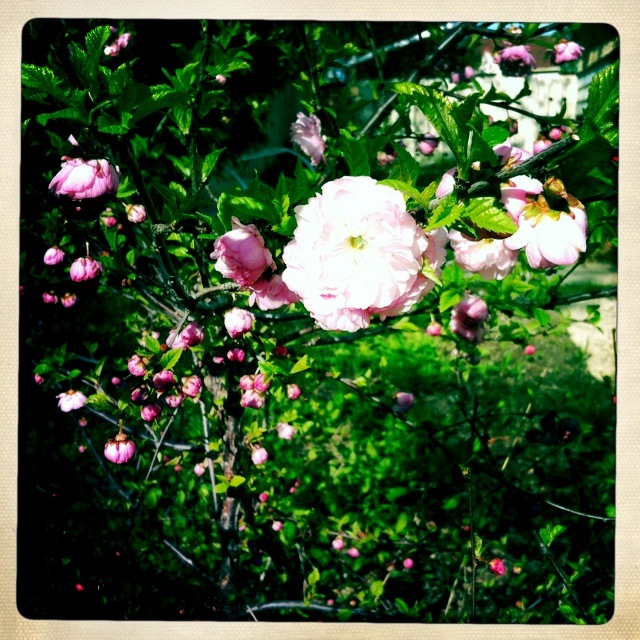 Categories: Think | Tags: Grow Write Guild, late spring, snow | Permalink. Another Grow Write Guild post, as prompted by Gayla over at You Grow Girl. This one’s a challenge for me. A professor recently recommended that I read The Other Side of Eden by Hugh Brody. Just previous to that, I stumbled on Toby Hemenway’s video, discussing the cultural impacts of agriculture. Both have left me reeling. I want, so desperately, to have a piece of land to call my home, my own. I want control. These works have challenged me to look at the world as something that, perhaps, no one can own. Damn it, I don’t want to share. I want a room all to myself at home. I want a garden all to myself in my front yard. I’ll welcome visitors, but I want to the final say as to which plants go where. But more than that, I want a society in which people are treated in an equitable manner. I want respect for all nations, all genders, all ages. I want to be part of the change. And that might mean giving up the dream of owning land. Owning the land means being able to sell it. Who are we to trade in a resource that will last for all eternity? What does this belief, that we can own the land, do for our interactions with other human beings? With our partners, friends, and enemies? As I pose these questions, I realize that I’ll probably never entirely know the answers. If this intrigues you, go read Brody. Watch Hemenway. Enlighten me. I don’t know where to go from here. I have so many questions. More, every day. I haven’t even started seeds, because I can’t decide if I want to grow on the sort-of-rented-but-not-really land I live on. I’m feeling a little overwhelmed. (Disclaimer, I never made it through all of Hemenway’s video – he might have the answers, if I watched ’til the end). ‘Bout this dream garden though. If, in fact, owning land can be part of an equitable society – even if it can’t, I suppose – I want a place to be, with a lush green canopy above a hammock. I want a tiny back deck, right outside my kitchen door, with pots of herbs and rain barrels filling the space. I want a garden that pushes the limits of the climate, and welcomes nature in. I want to grow hardy kiwi. I want a garden that produces most of the food that my family needs. I want a garden with an overwhelming harvest that demands I ask neighbours for help in processing it all. I want a garden full of art. Most of all, I want a garden that welcomes and strengthens the community, while providing a (very necessary) sanctuary for me. It’s about nature, the planet, and the environment, yes. But more than that, it’s about the people. It should feel something like the picture at the top. Vivid, dense, and exploding with life. It should be all the pictures and articles and learning I’ve collected here, somehow crafted into something whole. 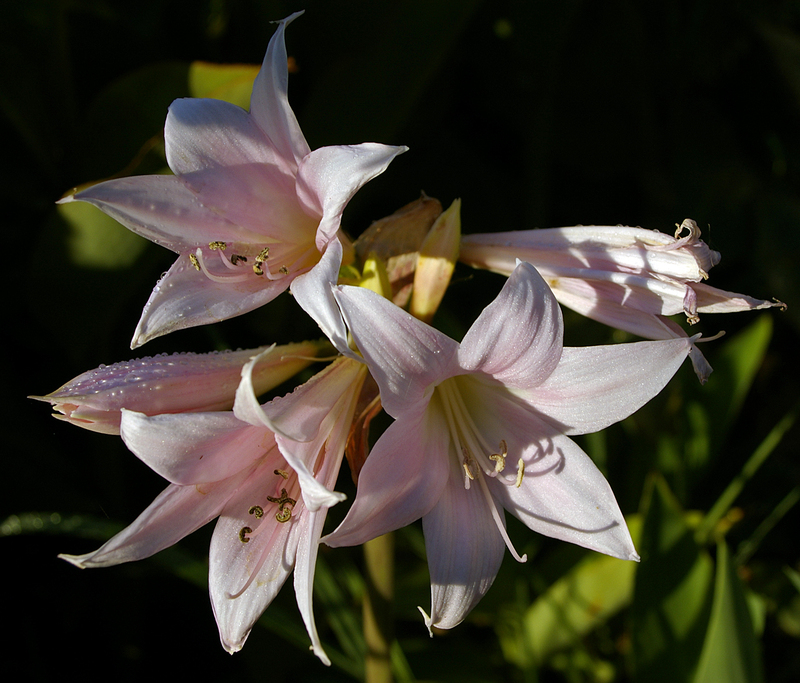 Categories: Grow, Think | Tags: dream garden, Grow Write Guild, Hugh Brody, Toby Hemenway | Permalink.